Ideas Chip and PIN extendable arm is another inclusive design initiative from Ideas that allows customers to have easy access to the same chip and PIN device, at the same sales counter, removing the need for what is often described as a dedicated ‘disabled’ sales counter. 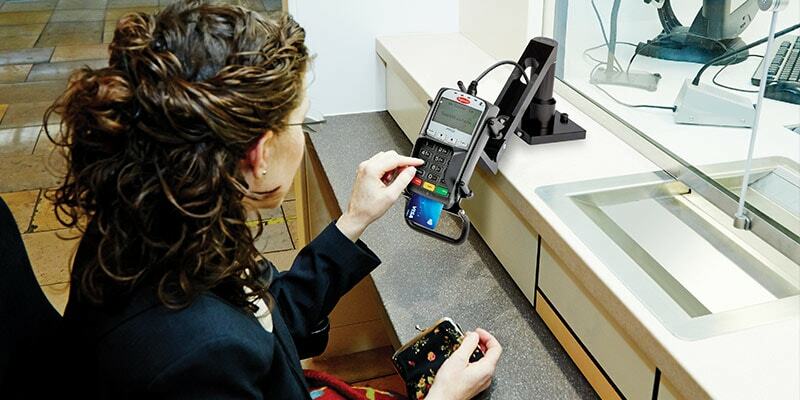 Customer feedback identified the need for seated or lower stature people to easily access the same chip and PIN device without over reaching, by extending the machine closer to the user. And also, for ease of use by standing customers. Extendable arm with smooth joints and adjustable cradle for PED mounting. Manufactured from tarnish-resistant solid aluminium – anodized. Adjustable cradle to suit different sizes of PED units. Improved visibility of the keypad and operation of the input device for seated customers or people of lower stature. Allows all counter positions to be accessible for all customers. Bespoke solutions available for other payment methods and devices.